2019 Ron Capps / NAPA / Dodge Charger R/T NHRA Mello Yello Funny Car diecast, by Auto World. 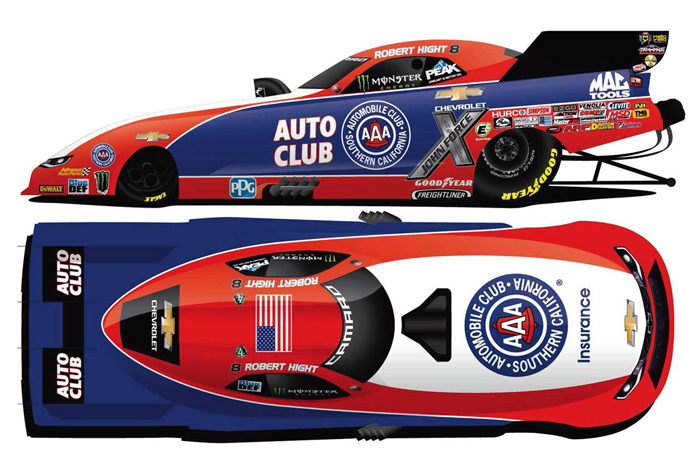 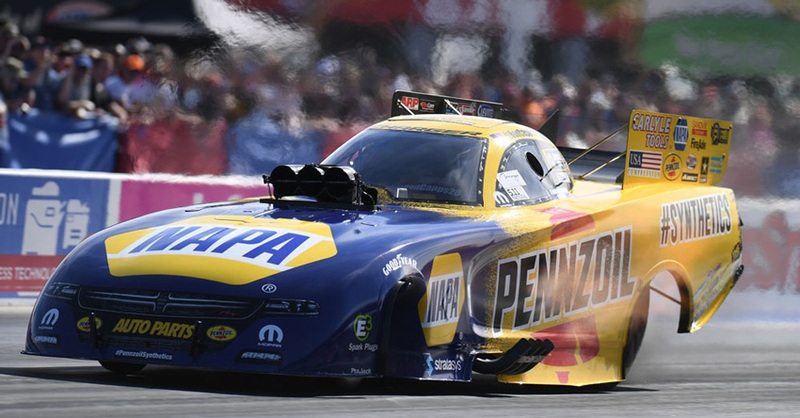 The Don Schumacher Racing NAPA Dodge Charger R/T Funny Car will be raced by Ron Capps during the 2019 NHRA Mello Yello Drag Racing Series season. 2019 John Force / PEAK / Chevrolet Camaro NHRA Mello Yello Funny Car 1/24 diecast, by Auto World. 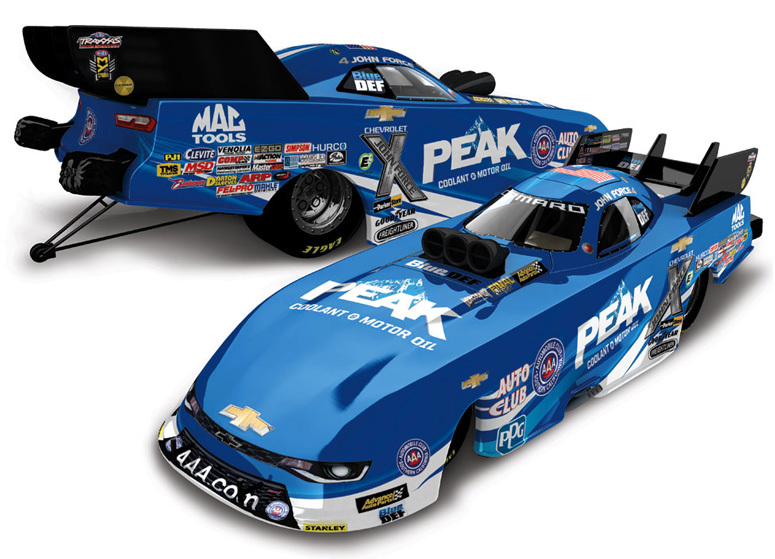 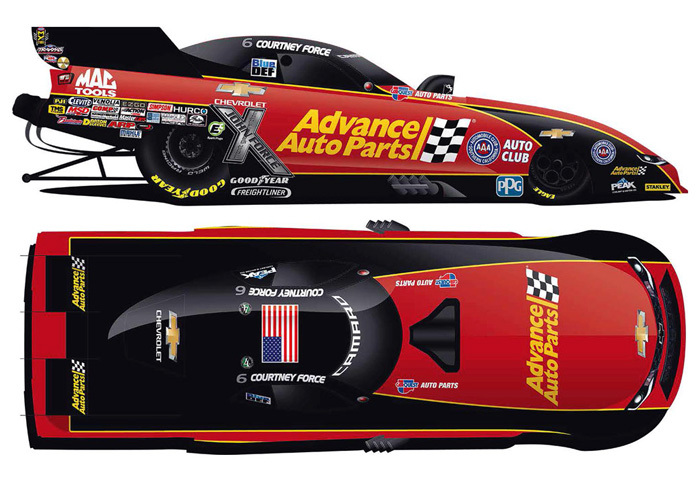 The John Force Racing PEAK Chevrolet Camaro Funny Car will be raced by 16x NHRA Champion John Force during the 2019 NHRA Mello Yello Drag Racing Series. 2018 John Force / PEAK / BOSS Shop / Chevrolet Camaro SS NHRA Mello Yello Funny Car diecast, by Action Lionel. 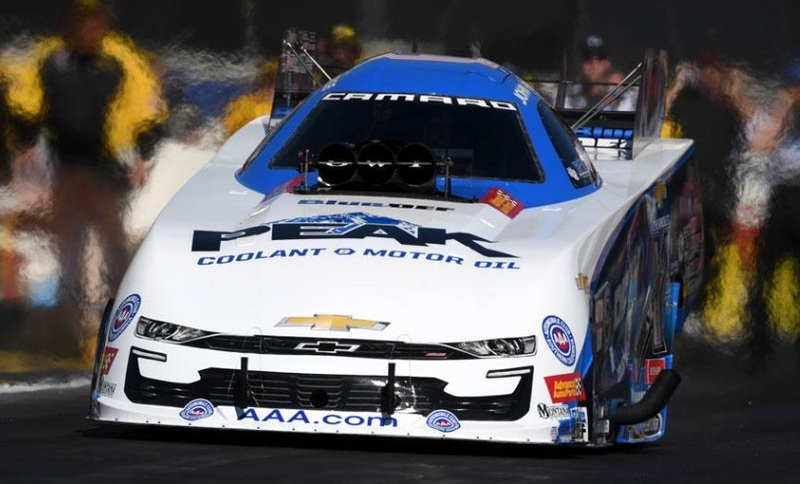 The John Force Racing PEAK Bosselman BOSS Shop Chevrolet Camaro was raced by 16x NHRA Champion John Force in the NHRA Mello Yello Drag Racing Series, DENSO Spark Plugs NHRA Four-Wide Nationals at The Strip at Las Vegas Motor Speedway on April 6-8, 2018. 2017 John Force Force / PEAK / Chevrolet Camaro SS NHRA Mello Yello Funny Car diecast, by Action. 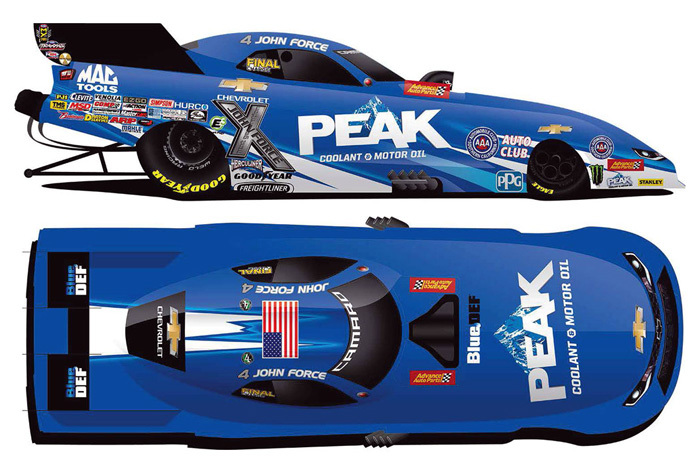 The John Force Racing PEAK Chevrolet Camaro SS was raced by John Force during the 2017 NHRA Mello Yello Drag Racing Series season. 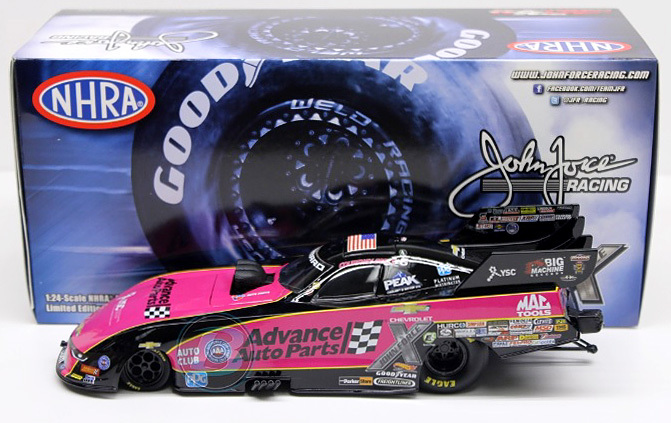 2015 John Force / PEAK / Chevrolet Camaro NHRA Mello Yello Funny Car diecast, by Action. 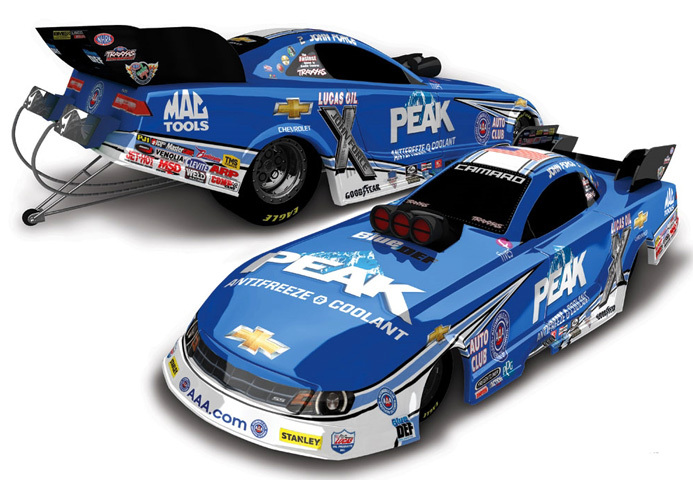 The John Force Racing PEAK Chevrolet Camaro was raced by John Force during the 2015 NHRA Mello Yello Drag Racing Series season. 2015 John Force / Traxxas / Chevrolet Camaro NHRA Mello Yello Funny Car diecast, by Action. 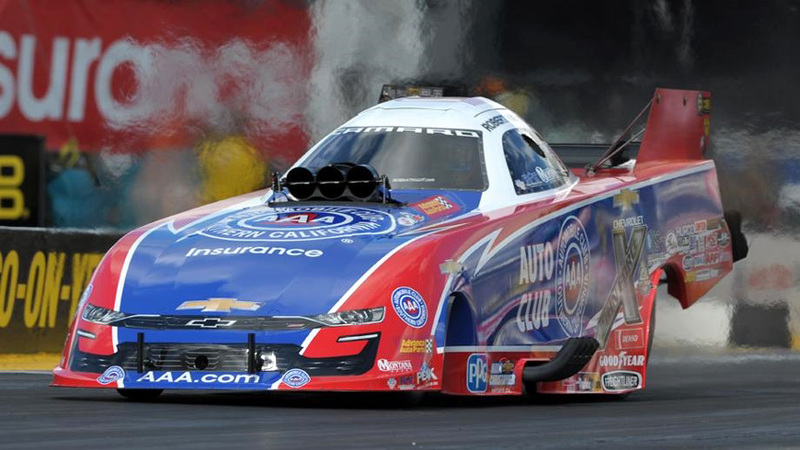 The John Force Racing Traxxas Chevrolet Camaro was raced by John Force in the 2015 NHRA Mello Yello Drag Racing Series, 30th annual AAA Texas NHRA Fall Nationals at Texas Motorplex. 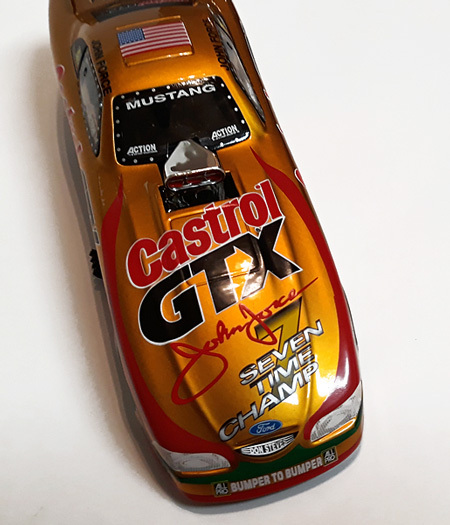 1998 John Force / Castrol GTX / 7x Champ / Ford Mustang NHRA Winston Drag Racing Funny Car 1/24 diecast, by Action. 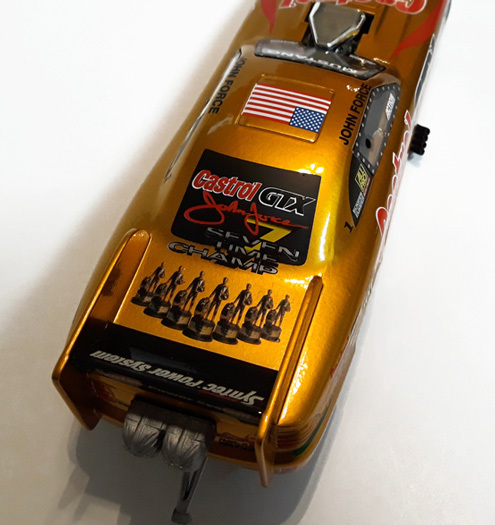 This John Force Racing Castrol GTX Gold NHRA diecast car features the 7-Time Champ logo on the hood and back window, along with 7 Wally trophies on the decklid. 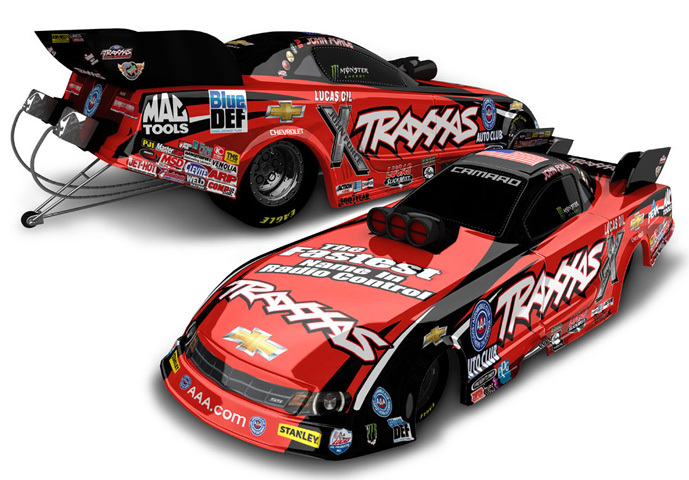 John Force, the 1998 and 7-Time NHRA Winston Drag Racing Series Champion! 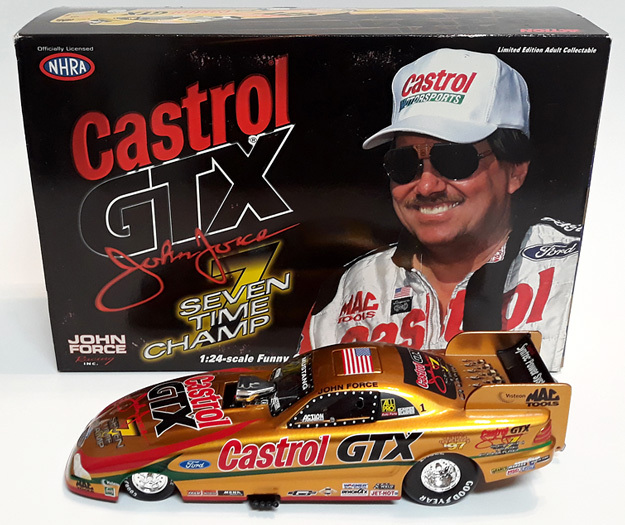 1993 John Force / Castrol GTX / Oldsmobile Cutlass NHRA Winston Drag Racing Funny Car 1/24 diecast, by Action RCCA. 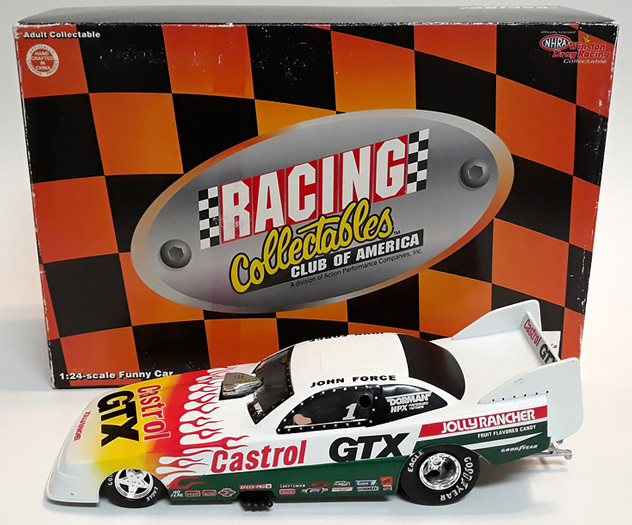 The John Force Racing Castrol Oldsmobile Cutlass was raced by John Force during the 1993 NHRA Winston Drag Racing Series season. 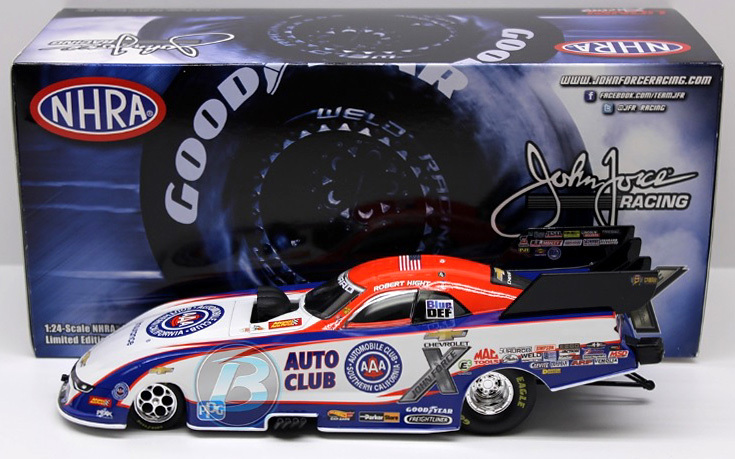 2019 Matt Hagan / Mopar Express Lane / Dodge Charger SRT Hellcat NHRA Mello Yello Funny Car diecast, by Auto World. The Don Schumacher Racing Mopar Express Lane Dodge Charger SRT Hellcat Funny Car will be raced by Matt Hagan during the 2019 NHRA Mello Yello Drag Racing Series season. 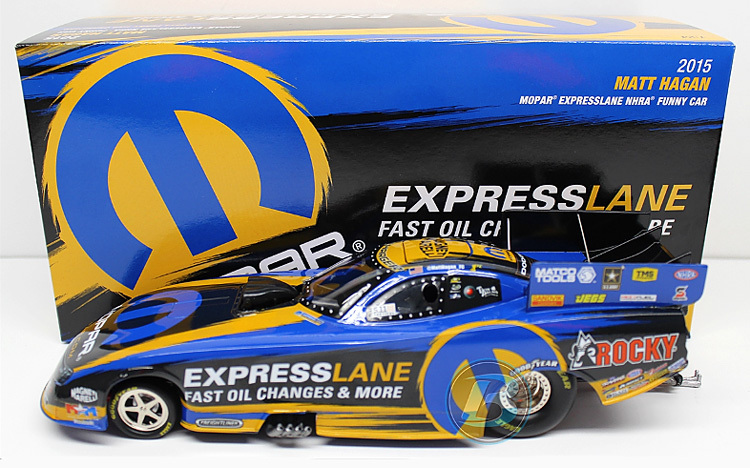 2015 Matt Hagan / Mopar Express Lane / Dodge Charger R/T NHRA Mello Yello Funny Car diecast, by Auto World. 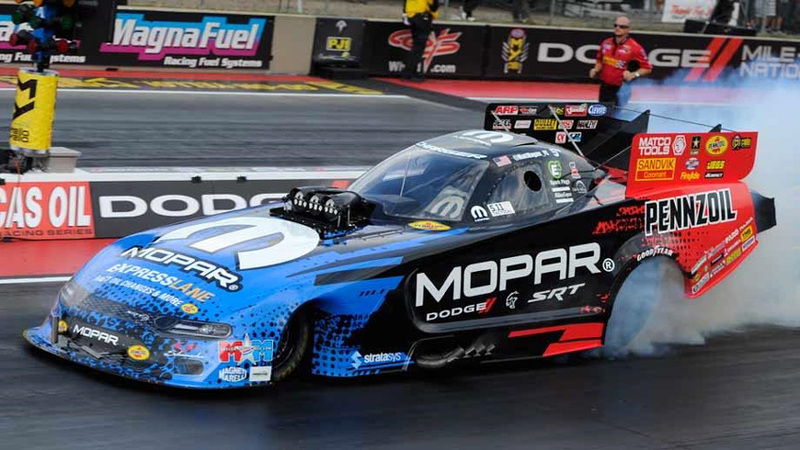 The Don Schumacher Racing Mopar Express Lane Dodge Charger R/T Funny Car was raced by Matt Hagan during the 2015 NHRA Mello Yello Drag Racing Series season.